I truly envy fellow cinephiles who connect with Godard’s “late period.” This, as I expected, was not for me. An impressive debut feature by Ana Lily Amirpour, this vampire western horror film is aesthetically and politically unique and injects some much needed fresh blood into “Iranian” cinema’s veins. The production values are top notch, but what starts as an intriguing, morally complex study of the concept of masculinity gives way to a fetishistic show of non-stop violence and video game shooting. Structurally and aesthetically, the Dardennes are working in familiar territory but, give or take Abbas Kiarostami, there are no other filmmakers in the world that deliver high quality work with such remarklable consistency. This one is both a portrait of marriage on the brink, an intimate drama about recovering from depression and a snapshot of lower-class life in Belgium as it recovers from economic crisis. The stakes are incrementally increased as Marion Cotillard’s character faces new moral challenges that complicate her struggle beyond black and white. It’s moving, graceful and tense, a worthy companion piece to Rosetta, with a central performance from Cotillard that rival Emilie Dequenne’s masterwork. The best crime film since Neighboring Sounds. Devilishly gorgeous cinematography and haunted performances create an atmosphere of bleak terror, an inanimate milieu in which signs of life are either absurdly comic for their incongruity – that dance scene! – or beget horror. The devastating and unforeseen finale brings violence full circle. Expert filmmaking. Neither the idea – did you know that the glossy sheen of Hollywood is only facade, covering a decadent, lifeless soul? It’s almost as Hollywood itself had never told us that before – nor Cronenberg’s execution are fresh or sophisticated enough to warrant this shrill exercise. There is never a sense that the humor isn’t forced and predictable. The conceit wears off before the first episode is over. It frankly never convinced me that if I proceed any further, I will find something fresh. This season keeps the momentum from the debut one and while it is impossibly even funnier than its predecessors, it also builds on the characters enough to convince the viewers they won’t become caricatures of themselves. A true achievement. Outrageously funny and remarkably consistent, with well written and continuously surprising characters across the board. Five films into his young career, Dolan has finally successfully kept his ostentatious stylistic predilections in check, channeling them in the service of his narrative. Like most of his previous films, Mommy could be tightened a bit, some of its unnecessary subplots cut, but it is otherwise as gritty as it is pretty. And Suzanne Clement gives one of the performances of the year, always suggesting something deeply painful and unsettled about herself beyond the external intensity. Much like in Rakhshan Bani-Etemad’s festival hit, Tales, Moaadi is easily the best thing about this film. One only wishes the film could match the nuance and energy of his performance. Tonally confused first half oscillates between exaggerated comedy and cartoonish procedural thriller, but everything settles after the midway reveal, gaining considerable momentum toward the thrilling finale. Pike (and everyone else in the cast) ace in a film that exhibits the bravura stylistic touch that we’ve come to expect of Fincher and his team. Scorsese brilliantly reflects on the curiosities of American culture, bureaucracy and its reactionary news machine. Could the whole film be a dream sequence, or is it a real account of diseased fascination with celebrity (with elevating celebrity to the skies and shattering them back down to the ground), of the chaotic solitude that comes with fame, of success as a mirage, of American dreamers as failures? 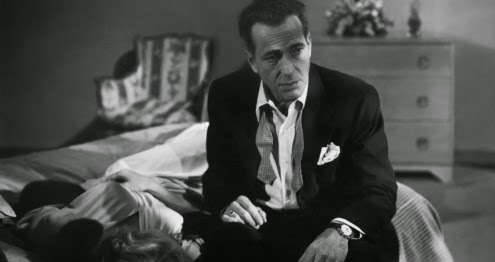 A thrillingly stylized film noir, a heartbreaking romance and a perceptive observation on Hollywood’s culture of celebrity that still resonates seven decades later; still elevated by the unparalleled complexity and subtlety in Bogart and Grahame’s performances. One of the greatest films of all time.